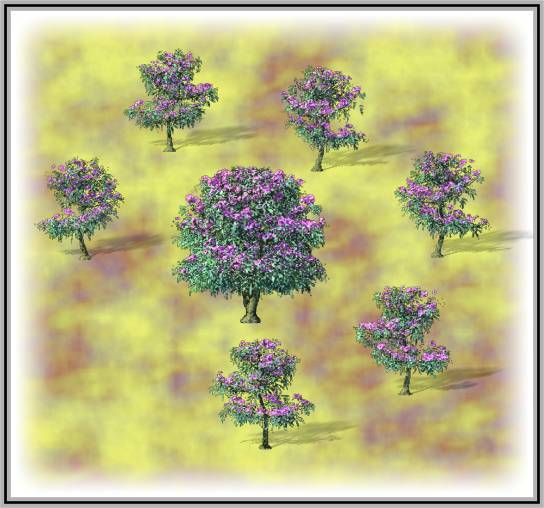 The trunk and branches of the little tree are made with Tree Druid, a Lightwave plugin; the inflorescences and the leaves are taken from an inflorescence I have created in PlantStudio; inflorescences and leaves are spread separately on the branches with the plugin Leaves Generator (500 leaves and 200 inflorescences). The rendering of ten little images (320 x 240) of the plant differently oriented is made in Lightwave 6.5 (my object is much more than 65.000 points or polygons) without applying any antialiasing. And finally I have created a "brush" in XaraX with the ten images, which permits to paint with hedges of old rhodos !!! The layout of this image is also thanks to XaraX.